Hangman! - a great game for improving your vocabulary and spelling. 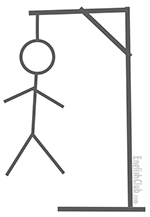 These Hangman games are arranged into topics and levels, with five games in each level. Can you find the word before the hangman hangs you? !